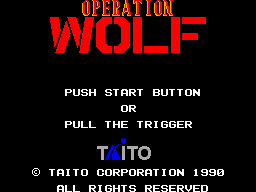 Operation Wolf is a port from the arcade game made in 1987 by Taito (as shown on the cover of the game). Let's all be honest, Sega is the master of arcade ports (at least most of the time) and this is compatible with the Sega light phaser so this should be a match made in heaven. Is it? Let's find out. The game utilises the Sega light phaser so it's probably already known what kind of game it is. A shooter. An arcade shooter. 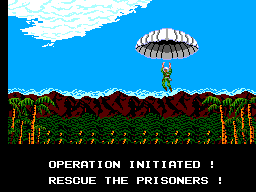 Basically the objective of the game is to save the hostages. Why only you are sent there to fight a whole army is quite questionable though. The concept of the game is very simple, you have 6 rounds and 4 levels to go through. Very hard levels. The graphics are very good and basically what you would expect from an 8-bit gaming console like the Master System. Although at times it can look even better(things like explosions and deaths can look better than everything else) and some of the enemies have great detail on them (the more close-up ones). The music is really good and gets you hyped up to play but a drawback is that the music will not play during a level and will only come on during the menu. This does mean though that the sound effects get to flourish. The shooting, the explosions, the screams when someone dies, all sound really great and don't get annoying at any time. Using a controller with a light phaser is definitely easier than using the control pad on its own. It's hard to aim using just the control pad as the aiming icon goes all over the place. Holding in the 1 button uses rapid-fire, which means your hand will not get sore from tapping. The 2 button will throw a grenade. Now using the light phaser and control pad is much easier. Firstly, try to have an old television when using the phaser as it might have a hard time with newer ones. 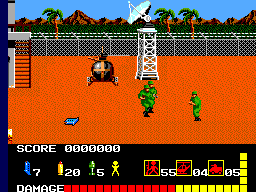 To play you obviously point your phaser at the enemies and shoot and you press 1 on the control pad to throw a grenade. It's very fun when playing this way, as you would probably expect. This game is extremely hard but extremely good. It is quite hard to just finish the first round at all and because of this you will probably be replaying it a lot, trying over and over to finish it. Although you can get very frustrated with the game at times, anyone will admit that it's still fun, even when it angers them. All in all this game, although one of the hardest games I have ever played on the Sega Master System, is very enjoyable. It can be frustrating at times but I would recommend it to anyone who has a light phaser. People who don't have a light phaser should pick one up if they want to play this game or it will just feel awkward. But if you think you can beat a hard game like this with the control pad, you can try. If you don't want to end up with a broken controller though, pick up a light phaser to play this game in all of its great glory.